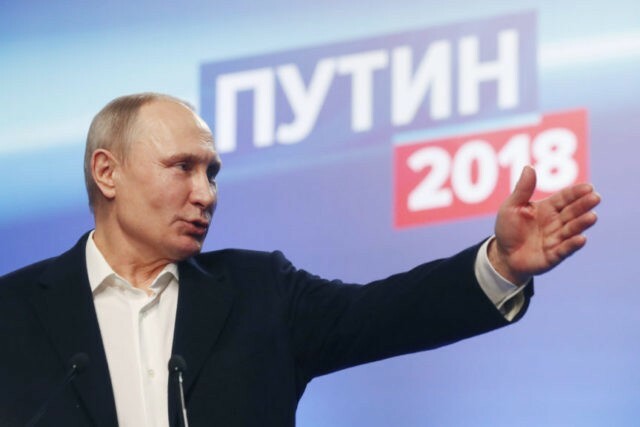 As expected, Russian President Vladimir Putin won re-election on Sunday and will evidently claim he passed the magic “70/70” margin he was looking for: winning over 70 percent of the vote with turnout over 70 percent. To be precise, Russia’s Central Election Commission claims Putin won almost 77 percent of the vote, a much higher total than his 64 percent victory in 2012. His closest rival was millionaire Communist Pavel Grudinin with 12 percent, followed by Vladimir Zhirinovsky of the Liberal Democratic Part with 6 percent. TV host Ksenia Sobchak, arguably the most Western-friendly of the candidates, scored less than 2 percent of the vote. Sobchak and Zhirinovsky clashed at a presidential debate Putin did not bother to attend when Zhirinovsky insulted Sobchak and she threw a glass of water in his face. CNN notes that, in addition to simply filling in ballots with Putin’s name on them, Russian election officials blitzed the public with text messages, billboards, and public-service announcements to juice turnout. The employees of one construction company told CNN their managers provided transportation to the polls. According to CNN, an independent watchdog group called Golos compiled over 2,700 reports of potential voting irregularities. NBC quotes Putin gadfly Alexei Navalny, who was barred from running in the election, claiming that officials are overstating the turnout by as much as 18 percent. Two election observers in Gorny Shchit, a rural district of Yekaterinburg, told the Associated Press [AP] they saw an unusually high influx of people going to the polls just before 2 p.m. A doctor at a hospital in the Ural mountains city told the AP that 2 p.m. was the deadline for health officials to report to their superiors that they had voted. Observer Sergei Krivonogov said voters were taking pictures of the pocket calendars or leaflets that poll workers distributed, seemingly as proof of voting. ABC News notes that both carrots and sticks were employed to drive Russians to the polls. Officials were told to treat the election like a “holiday” and they responded by creating a circus atmosphere at polling stations, including one Moscow station where a woman led an aerobics class to a pulsating techno beat. On the other hand, some Russians were told their jobs or university berths were at risk if they did not show up to vote. Just to make sure everyone got the nationalist message, Election Day was moved so that it coincided with the anniversary of Russia’s annexation of Crimea. Emboldened by his purportedly sweeping victory, Putin lashed out at Europe for accusing his government of perpetrating a nerve-gas attack on former spy Sergei Skripal in the United Kingdom. Police and intelligence officials believe the gas was pumped through the ventilation system of Skripal’s car and may have affected up to 38 other people in Salisbury. “Any sensible person understands that it’s a complete fantasy, rubbish, nonsense, that someone in Russia might do something like this on the eve of the presidential elections and the World Cup. It’s simply unthinkable,” Putin thundered at a press conference after a victory rally in Moscow on Sunday. “Nonetheless, irrespective of all these difficulties, we are ready to work together and ready to discuss any subject and to overcome any difficulties,” he added. European papers quoted by the BBC agreed that Putin was probably helped in the election by the confrontation over Skripal, benefiting from the new Cold War climate he has created in Russia. Former Deputy Assistant Secretary of Defense Evelyn Farkas saw Putin’s big win as a harbinger of increasing tension with the West in an interview with CNBC on Monday. “Things are not going to get better between the U.S. and Russia in the near term. We’re going to continue to have as much tension as we’ve had,” Farkas predicted. In addition to blaming each other for sabotaging effective political resistance to Putin, would-be opposition leaders must face the reality of an electorate so heavily controlled by the Kremlin, so paranoid due to Putin’s New Cold War rhetoric, and so jaded by corruption that they cannot get worked up about the possibility of dramatic change. Navalny will have a difficult time convincing anyone that his boycott of the election had any serious effect on turnout. In theory, the opposition will not have to worry about running against Putin again, since term limits prohibit him from running for re-election in 2024. 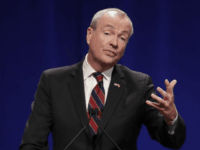 He scoffed at the notion of waiting until he becomes eligible to run again in 2030—“It’s ridiculous. Do you think I will sit here until I turn 100?” the 65-year-old president snapped, and claimed he has no plans to amend the constitution to remove turn limits, as his ally Xi Jinping of China has done.